The Imperial Japanese Navy sought the development of a long-range four-engined bomber which could provide strategic strike capabilities to counter the US long range aviation strike capability. Nakajima was given a specification for a bomber that could fly 2000 nautical miles with a top speed of 320 knots and carry an 8800 pound bomb load (or a reduced load out to 4000 nautical miles). Nakajima produced the first G8N Renzan prototype one year after the the final specifications with first flight in October, 1944. Powered by four 2000 horsepower Homare engines, the G8N could have countered the approaching allied forces by denying them regular use of their airfields and targeting supply bases. 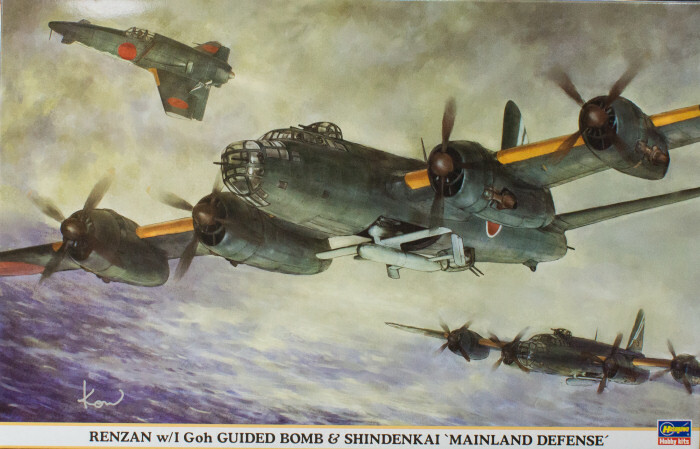 The G8N1 was to be a heavy bomber, the G8N2 was to be modified to carry external guided munitions such as the Okha Type 33 manned and rocket-powered Kamikaze anti-shipping weapon or the I-Goh guided bomb which appears to be a Japanese-produced version of a German anti-shipping guided bomb. While several prototypes were completed, production of the Renzan was cancelled near the end of the war due to the shortage of strategic materials needed for the project. You've probably heard of the Luft '46 modeling realm where modelers examine what might have been had the war unfolded differently. Here is the Japanese equivalent looking at two aircraft and one weapon that might have been. This is Hasegawa's classic G8N Renzan (Rita) kit in its G8N2 configuration, but rather than carrying the Okha, it is carrying a variation of one of the German guided bombs from its weapons bay. This would have been the maritime interdiction configuration that would have had devastating results like the German guided bomb attack on the battleship Roma. The Renzan kit is an earlier Hasegawa tooling with raised surface detailss but continues to look good for its age. A new-tool sprue with the I-Goh anti-ship weapons is added to this release as is the recent 1/72 J7W1 Shinden kit that also includes the additional parts for the turbine powered J7W2 Shindenkai version. 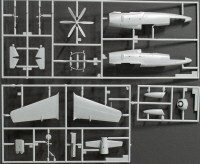 Molded in gray styrene, this set of kits is presented on nine parts trees plus two trees of clear parts. If you're one of the many modelers who enjoy modeling what might have been, this release provides two really interesting subjects which could have protracted the Pacific war until other counter-developments coming from the allies (like the B-36) came online. For a look at the J7W2 built-up, look here.